Dec 6, 2018: Madison Lofing presented her research at the Undergrad Research Symposium on Dec 6. Madison examined whether flower morphology affected honey bee visitation rates. She found that honey bees preferred composite flowers over non-composites but that there was also preference for certain plant species. Way to go Madison on your first independent research project! Oct 9, 2018: Our ant diversity paper entitled “Disturbance differentially affects alpha and beta diversity of ants in tallgrass prairies” is finally published in Ecosphere! We found that harvesting grasslands had contrasting effects on local (alpha) diversity of ants and species turnover (beta-diversity) suggesting trade-offs in maintaining different forms of diversity. Sept 7, 2018: I currently have funding for a Master’s or PhD student to start Fall 2019 (or Spring 2019 at the earliest). 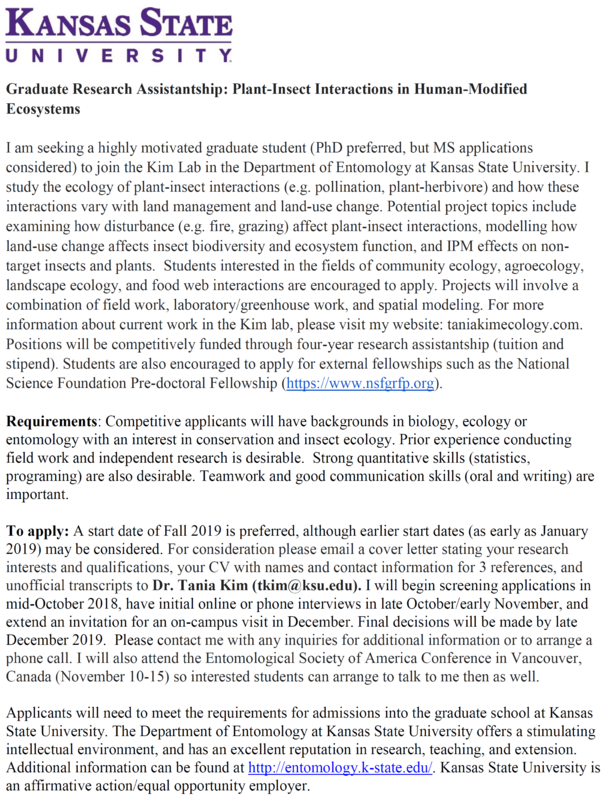 Highly motivated students interested in landscape ecology, community ecology, plant-insect interactions, agro-ecology, or conservation, should contact me during fall 2018 for 2019 enrollment. See here for more information. I currently do not have funding for postdoctoral research but am willing to write grant proposals with prospective postdoc. Please see opportunities page for more details. Sept 6, 2018: Are you an undergrad interested in gaining research experience? If so, check out the Undergrad Research Experience in Entomology program! Aug 16: The Kim lab was awarded two USDA grants. Grant #1: In collaboration with Claudio Gratton (UW Madison) and Brian Spiesman (KSU), we will examine how spatio-temporal heterogeneity in prey resources affect predator population dynamics in ag landscapes in WI. Grant #2: In collaboration with Ebony Murrell (The Land Institute) and Brian Spiesman (KSU), we will examine how border crops affect predators and pollinators in KS. Interested in helping out? Check out the opportunities page for details on how to get involved. Aug 1, 2018: Honored to be part of this review article (I’m author 76 of 157 authors!) published in PNAS this week. This review article, which utilized data collected from 132 studies from 31 countries worldwide, showed that natural habitat surrounding crop habitat may not consistently provide increased biocontrol of crop pests. Click here for UC Davis press release. July 29, 2018: NSF Graduate Research Fellowship Program applications are due in October 22 for Life Science. 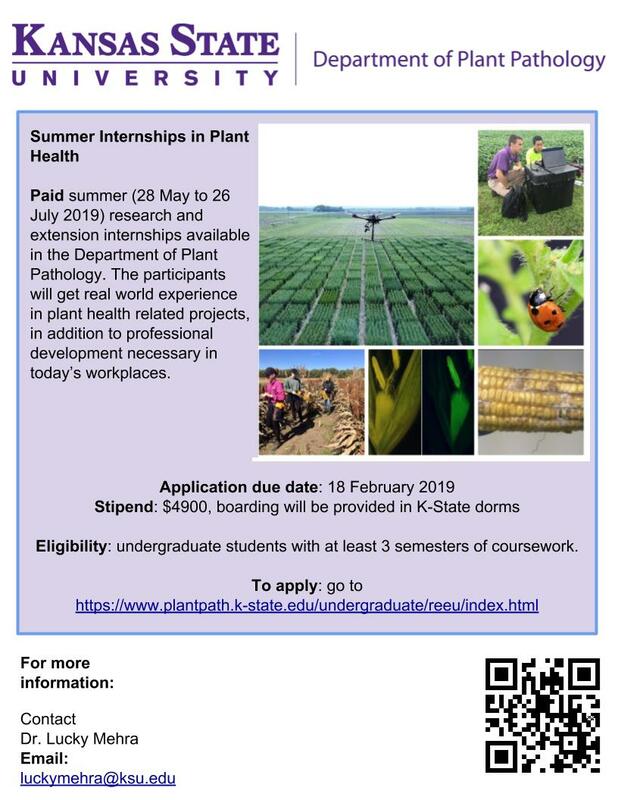 Students interested in putting together an application to work in my lab should contact me in early fall. July 24, 2018: Tania will be heading to New Orleans for the 103rd Annual Ecological Society of America meeting (#ESA2018). Students interested in joining my lab should contact me and we can meet up for coffee! July 1, 2018: The Kim lab moved to Kansas State University!